This past weekend, Rex and the girls and I had the pleasure of attending a reception for our neighboring artist, Kate Leigh Cutler at the NJ Museum of Boating. 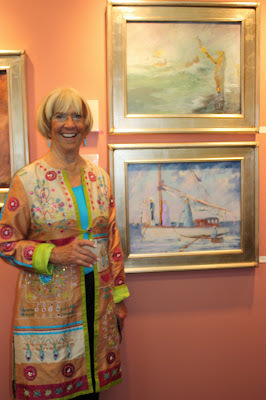 Kate’s show, The Maritime History of the Barnegat Coast, opened with the reception on Sunday, July 27th, and runs through Labor Day Weekend 2008. 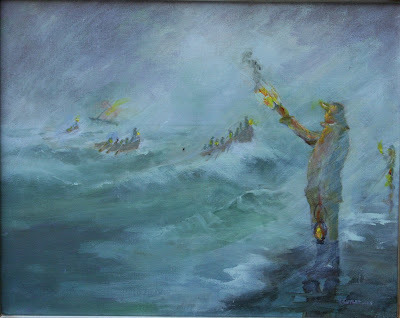 I’ve said it before, but now that I’ve seen all of the paintings in the show, I’ll repeat that this study really breaks new ground (or water) for her…most of the new paintings are dark and ominous, tales of storms and shipwrecks. I purchased the painting shown above for Rex’s birthday, but there are lots of other moody Kate Leigh Cutler paintings left for you, and you’ll have the rest of the summer to check it out…the show runs through September 1, 2008, at the New Jersey Museum of Boating (at Johnson Brother’s Boat Works) in Bay Head, NJ.